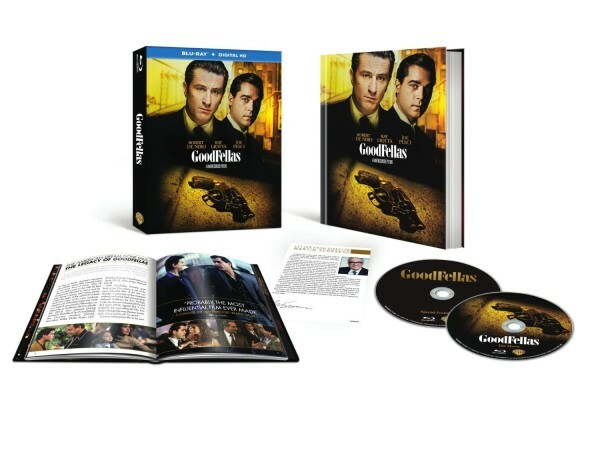 Warner Bros. Home Entertainment is celebrating the 25th anniversary of Martin Scorsese’s GoodFellas with a NEW 2-Disc Blu-ray featuring all the original extras and a new documentary with interviews from Robert De Niro, Leonardo DiCaprio, Harvey Keitel, Ray Liotta and more. The package will also include a 36-page photo book that explores the film’s influence and a special letter written by Scorsese. Hailed by film critic Roger Ebert as the best mob movie ever (take that Godfather! ), it has been remastered from a 4K scan of the original camera negative, supervised by Martin Scorsese. Fans can also own GoodFellas on Digital HD via purchase from digital retailers. ALL-NEW Documentary includes interview with the Director, cast and some of your all-time favorite movie gangsters! Join some of Martin Scorseses greatest gangsters Robert De Niro, Leonardo DiCaprio, Harvey Keitel, Ray Liotta, Jack Nicholson and Joe Pesci to discover what its like to work for perhaps the greatest gangster director of them all.